On this Easter Monday, play-off chasing Woking secured their fourth win in five games to condemn Eastleigh to their sixth match without victory. With Saturday’s defeat at Dover, Eastleigh really needed to end their disappointing run this afternoon after a dismal return of just one point from a possible eighteen in their last six fixtures. It was make or break at the Silverlake, as far as the Spitfires’ slim promotion hopes were concerned with the club finding themselves ten points adrift of a second successive playoff campaign. In the opening stages of the game it was the visitors who threatened with Moses Ademola making his presence felt with just four minutes on the clock. Attacking down the right flank, the midfielder made a surging run to skip past Brett Poate almost effortlessly but had his low cross cut out by Jason Matthews ahead of the unmarked Craig Faulconbridge. With ten minutes played, Ricky Anane picked out Faulconbridge in space, whose first touch got the better of him when turning and looking to shoot. 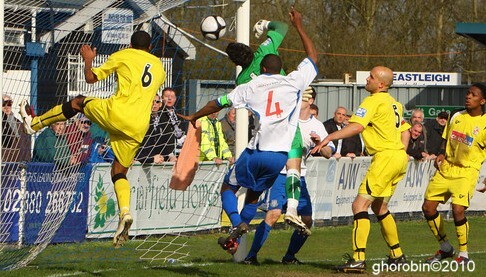 The ball got away from the striker and Eastleigh were able to clear. Eastleigh’s first chance came a minute later when Tony Taggart delivered a dangerous cross from the left. Shaun McAuley swung and missed at the first attempt but had a second chance to trouble the keeper with a shot on the spin, only to fire straight into the gloves of Ross Worner. Three minutes later McAuley played a neat one-two with Ross Bottomley before having a chipped effort turned away by the keeper. The ball fell kindly for Richard Gillespie in front of goal who couldn’t quite keep his header under control. Ademola continued to trouble Poate and went clean through on goal down the right midway through the first half. The Woking man decided to go alone and shoot from a far too acute angle despite having better options in the centre with two yellow shirts waiting to his left. On the half hour, a high, hooked cross from Richard Gillespie produced an awkward bounce in the penalty area only for Worner to claim the ball well under pressure from McAuley who was looking to head home. Woking went on to enjoy a spell of pressure with Nathaniel Pinney coming closest with a powerful strike that had to be headed away from danger by the Spitfires captain Tom Jordan. Ten minutes before the break, Eastleigh’s Taggart and McAuley combined to good effect on the far side. McAuley pulled the ball back from the by-line to find Anthony Riviere 25-yards from goal. The tireless midfielder pulled the trigger with a fine strike that looked to be heading for the top corner but was denied by an excellent headed block by Tom Hutchinson, the Card’s skipper. The hosts came even closer moments later when Taggart pounced on a loose ball just six yards out. This time Eastleigh were thwarted by the heroic defending of Tony Sinclair who made a stunning intervention by closing his marker down and denying an otherwise certain goal. The action went straight down the opposite end of the field in the 37th minute when Pinney fired across goal on the counter attack. Matthews parried the shot from the left with Brett Poate on hand to hook the ball clear. With the game more than coming to life with end to end action and chances coming thick and fast now, Richard Gillespie carried the ball forward for Eastleigh and won a corner. Woking broke the deadlock four minutes before the break when Pinney squared from the right to find Nicky Nicolau. Jason Matthews made a splendid stop from point blank range to deny Nicolau a goal but could do little about the rebound as GIUSEPPE SOLE followed in with an unstoppable drive to find the back of the net from the edge of the box. After a first half where either side could have gone in to the break with a lead, the second that followed was disappointing for the home fans as things went from bad to worse, as the afternoon unfolded. Four minutes in to the half, Nathaniel Pinney made a storming run through the centre of the pitch as he turned his marker and strode purposefully forward leaving defenders in his wake. The striker’s pace ensured he left Tom Jordan and Aaron Cook for dead, whilst Peter Adeniyi and Anthony Riviere chasing back from midfield could do little to catch Pinney either. Having run all of 60-70 yards, the on-loan Crystal Palace forward continued by rounding Jason Matthews but having done the hard work with a fine run, Pinney blazed over the bar with the goal gaping. It could quite easily have been 2-0 to the visitors and would surely have been a contender for goal of the season had the striker managed to keep his composure to match his athletic approach play. Two minutes shy of the hour, the goal scorer Sole drilled in a free kick which produced a decent save out of Matthews low to the centre of goal. The Spitfires’ best chance fell for Richard Gillespie who burst into the Woking penalty area unchallenged only to fire high over the cross bar with only the keeper to beat. Graham Baker introduced three pairs of fresh legs using all of his substitutions in the space of four minutes; before Tom Jordan was shown a second yellow card leaving Eastleigh trailing by a goal and now down to ten men to add to their woes. The towering centre half mistimed a challenge on the half way line by fouling Harry Arter meaning referee Ashvin Degnarain was left no choice but to send the Eastleigh captain off. It was always going to be a struggle for Ian Baird’s side from here on and so it proved as Woking looked to make the most of their numerical advantage. Matthew Wright had plenty of time and space to shoot in the 66th minute but saw his poor effort lack any conviction after a chipped through ball by Jerome Maledon. The substitute should have done better having made a good run and beating the offside trap but could only muster a tame effort straight at Matthews. Ross Bottomley reverted to a centre back role following Jordan’s sending off. 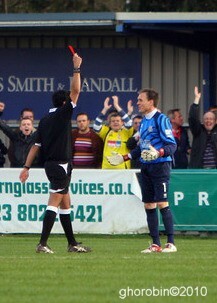 Woking played possession football at times to frustrate Eastleigh, whose afternoon was about to go from bad to worse. A through ball from Arter in the 75th minute saw Wright in behind the defence and one on one with Jason Matthews despite looking suspiciously offside. The flag stayed down as Matthews raced off his line only to catch the striker and deny a clear goal-scoring opportunity. Being the last man, the Eastleigh goalkeeper was shown a straight red card leaving the Spitfires in all sorts of trouble having to play the game out with just nine players. With the foul being inside the area, a penalty kick was also given. There was a delay in the taking of the kick as defender Aaron Cook was sacrificed to make way for substitute goalkeeper Billy Lumley. The youngster did his best to distract the penalty taker by running on and moving the ball off the spot to get a feel for the ball. Lumley then did a couple of stretches to add further delay, but he needn’t have bothered as his first task of the afternoon was to pick the ball out of the back of the net. NATHANIEL PINNEY kept his cool to send the keeper the wrong way and find the bottom right hand corner of goal from the penalty spot. It was the 20-year old striker’s last game for the club before returning to Crystal Palace and no doubt a fine way to sign off by doubling Woking’s advantage to 2-0. Brett Poate then blazed a free kick from a promising position wildly out of the ground following a foul on Gillespie. Eight minutes from time, an in-swinging Tony Taggart corner had the Woking keeper in all sorts of trouble with a delivery of the highest quality that came back off the woodwork. Young reserve striker Alex Easton got a second run out for the first team in a matter of days coming on for Shaun McAuley in the closing stages of the game. Woking had three chances to add a third goal with Nicolau squandering a great opportunity to extend the visitors’ lead, as did Arter soon after. Sam Butler failed to trouble the keeper with a late Eastleigh free kick in injury time, but the points were already secure for Woking who will be pleased to have kept up the momentum in their push for the playoffs. 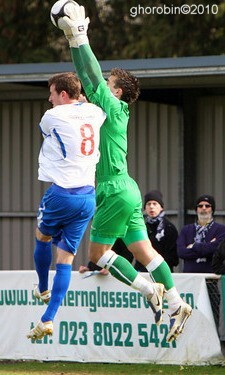 Eastleigh on the other hand will now be looking to finish as strongly as possible and begin building for next season.